The Precentor of Wells Cathedral is an ancient office and is held with the titular prebend of Whitchurch. The word precentor comes from the Latin preces cantor – singer of the prayers, and the role today involves the oversight, planning and direction of the Cathedral’s daily round of worship as well as the many special services throughout the year. The Precentor also oversees the Music Foundation on behalf of the Chapter, working closely with the Cathedral musicians, for whom he also has pastoral care. Nicholas trained for ordination at the College of the Resurrection, Mirfield, following a degree in Theology at King’s College, London. He also has an MA in Theology from Leeds University. 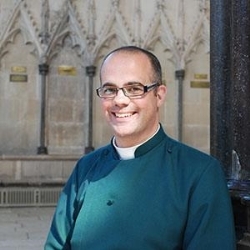 Ordained in 1998, Nicholas has been Chaplain to a Bishop and Vicar of parishes in Brighton and London. Before coming to Wells he was Precentor at Portsmouth Cathedral and Examining Chaplain to the Bishop of Portsmouth. He also taught Greek and Homiletics for six years on the Southwark Diocesan IME programme. Most of Nicholas’s interests are related to music: particularly conducting and singing. He also enjoys travel, especially with his wife Joanna, formerly Chaplain to the London College of Fashion and baby son, Raphael.